Buy Carrie Dennison a Coffee. ko-fi.com/pressfordesign - Ko-fi ❤️ Where creators get paid by fans, with a 'Buy Me a Coffee' button. Hi, I'm Carrie, an illustrator and community art workshop teacher based in north east England. 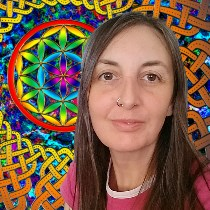 My work is based mainly on Celtic knotwork, sacred geometry, mandalas, psychedelic and nature themes. I have free downloads, projects and more on both my blog and YouTube channel, come and have a browse and get creative! If you enjoy these free creative downloads and projects, please consider buying me a coffee! I have recently brought out a Celtic Knotwork Colouring Book, the result of two years of illustration work. Check it out in the video below. Illustrated book number two is now in the works, and I am raising funds to help me create it. All donations will receive a free mandala colouring page download as a thank you for your support. Thanks for stopping by and I hope you enjoy the projects and free downloads! Welcome to my Ko-fi Page. If you enjoy my free downloads, tutorials and projects, please consider buying me a coffee. Each lovely supporter will receive a free download of a mandala colouring page. Thanks for your support! Secured Payments. Support goes to Carrie Dennison's account. Upgrade Carrie Dennison to a yearly Gold Membership with a one-time payment.